Due to many questions and requests about makeup and face shapes, I decided to do a series of posts about makeup tips, cuts and hairstyles for different types of face. If you still don’t know your face shape, there’s a great resource to find out here. If you still can not say which one is yours, read about the characteristics of each format in the following posts. As I divided this series into parts, I focused only on contour and illuminator makeup tips for each face shape. You’ll find in some instances specific tips for eye makeup, but it will be covered only briefly. 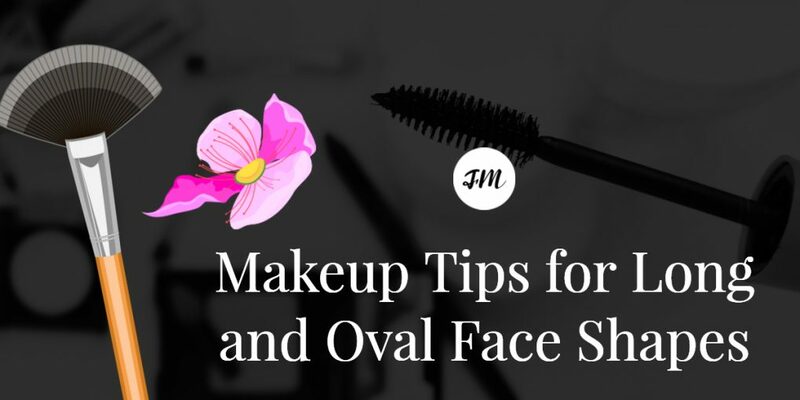 But, do not worry that I’ll detail the tips for all face shapes and put everything on the new “Makeup Guide” section, which will be made available here soon. Features: Its main characteristic is the fact that it is longer than wide. The forehead, jaw, and cheekbones are about the same width. The difference between the oval face shape and the long one is width length. Long-shaped faces have about twice as much height as they do width. The objective is to create the illusion of an oval face. Making it look shorter and wider, decreasing the width by darkening the top and bottom of the face. – Perfect the effect by involving an airbrush finish by applying a blush starting again in the temples and working your way down to the cheekbone area. You can use the same powder brush from the last step. – Use highlighter for the higher areas of your face such as brow bone, temples, nose’s bridge area, chin and cupid’s bow. – Add an illusion of added width to your face by applying blush on the apple cheeks, blend towards the back and then out. – The hairline and top of your forehead should have bronzer applied as well as to the bottom of your cheekbones working your way towards the temple area with a good powder brush.Same thing for the area under the chin and along the jawline. The bridge of the nose should see an application of bronzer too. – Areas to apply highlighter on should be the brow bone, the tip of the nose and the higher part of the cheekbone. It’s not necessary to use a highlighter to forehead and chin because it will add the appearance of height. Both techniques help reduce face length. When choosing a blush, it is important to take into consideration the natural or neutral colours. It is necessary to go around the cheekbones, but without exaggerating or letting appear artificial. In doing so, the emphasis is placed on the jaw, which hinders the aim of making a face look wider and shorter. The blush should be applied more horizontally than vertically, as if you were sunburned, working your way up at the very end (make a curvy at the end – as in the first image). Start from the extremities of the face towards the nose, stopping more or less toward the tip of the eyeball, which equals about two fingers of the nose. That way, you will not get too close to the nose, making a face look thinner than proportional. Don’t miss out on these bestselling beauty products. Check them out!